Delaware County Sheriff Russell Martin swears in new deputy Nick Ambrozich on June 18. Ambrozich has been working towards this job for the past seven years, he said and studied at the Delaware Area Career Center, OSU and interned with the DEA before being hired on at the Sheriff’s Office. After seven years of education and training, Nick Ambrozich is now a deputy with the Delaware County Sheriff’s Office. Ambrozich, 23, said he has been training to be a law enforcement officer ever since he was 16 and joined the Delaware Area Career Center’s law enforcement program. After completing high school, Ambrozich studied criminology and security intelligence at The Ohio State University, where he also interned with the Drug Enforcement Agency (DEA) and worked to stop doctors who were writing illegal prescriptions. During high school, Ambrozich said he was also part of the Explorers Program at the Delaware County Sheriff’s office until he turned 21 and he aged out of the program but stayed on as an advisor. He added that he plans to become an official advisor in the Explorers Program with the sheriff’s office to give back to the next generation. Ambrozich said he graduated from OSU in 2017 and was hired on by the Delaware County Sheriff’s Office. Ambrozich said after he was hired he enrolled in the Delaware Career Center’s Ohio Basic Peace Officer Training Academy, which he completed in May of this year. “I’m really excited to get out there and finally do what I’ve spent years preparing for,” Ambrozich said. Ambrozich was sworn in at the Sheriff’s office on June 18 and is now working with his field training officer. Ambrozich said he was thankful for the sheriff’s office and the DACC for the opportunity. 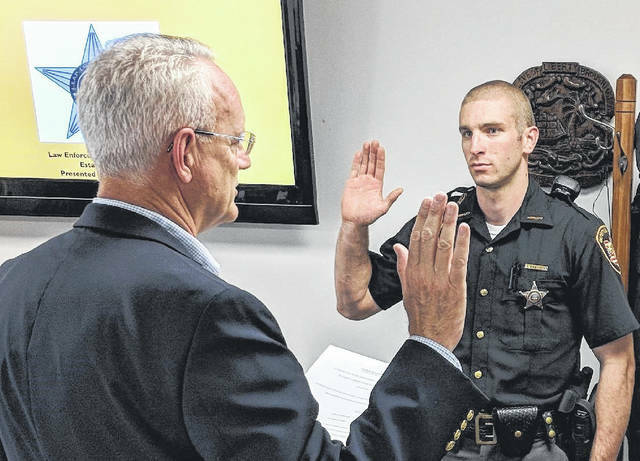 https://www.delgazette.com/wp-content/uploads/sites/40/2018/06/web1_Nick-Ambrozich-swear-in.jpgDelaware County Sheriff Russell Martin swears in new deputy Nick Ambrozich on June 18. Ambrozich has been working towards this job for the past seven years, he said and studied at the Delaware Area Career Center, OSU and interned with the DEA before being hired on at the Sheriff’s Office.